Provide comfort for the family of Alvira Russell with a meaningful gesture of sympathy. She has gone to heaven to be with her Lord and Savior, Jesus Christ. 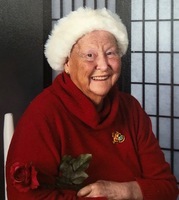 passed away early on Thursday morning, March 14, 2019, with her children by her side. Alvira was a member of the Baptist Church in Mattawamkeag for about 70+ years. Alvira brought many children and friends as well to church with her. Over the years, she was the Church treasurer, she taught Sunday school classes, and she was there almost every time the church doors were open. She enjoyed selling Avon for many years, and was a Presidents Club member for most of those years. Alvira was predeceased by her husband, Wyman Russell Sr., a son James Russell, two grandsons William and James Russell, and a son in law Stephen Gagnon. Her sister Ina, and all of her inlaws. Alvira is survived by her brother Henry Drager of Lagrange Me, a sister Mabel and her husband Bernard Bennett of Glennburn. at 11:00 a.m., at the Mattawamkeag Cemetery. Arragements are by Lamson Funeral Home, Clay Chapel. To plant a memorial tree in honor of Alvira Russell, please visit our Heartfelt Sympathies Store. We encourage you to share your most beloved memories of Alvira here, so that the family and other loved ones can always see it. You can upload cherished photographs, or share your favorite stories, and can even comment on those shared by others. May the family of Alvira Russell please accept my sincere condolences hoping you find comfort in God's words at Acts 24 : 15 and Psalm 37 : 29.